Baking out the moisture in a commercial doctor’s office. We had them back in their suite in 36 hours— that sure beats 3 weeks! There is a reason why homeowner’s and renter’s insurance doesn’t cover flood damage repair. Besides a hefty price tag on destroyed belongings and structural issues, the process of flood damage restoration is both time-consuming and complicated. Every case is unique and requires a seasoned professional to assess the damage, design a treatment strategy and execute the strategy to the customer’s satisfaction. 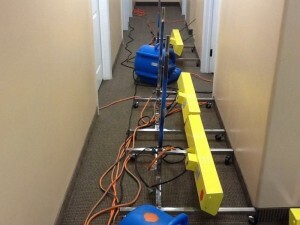 Unmatched customer service is why KIC Restoration is one of the best flood damage cleanup services in San Diego County. Regardless of if you have flood insurance or not, if your home or business suffers major water damage, it is probably unexpected. However, one thing you can expect is that insurance companies will do whatever they can to save money, not for the customer, but for their own agenda. KIC Restoration acts as a medium between the property owner and the insurance company to ensure that all dealings are conducted fairly. The company specializes in the most cost-effective methods of flood damage restoration and operates under the belief that beating customer expectations is a business’s most valuable advantage. There can be a world of difference in the outcome of a flood restoration that is completed by two different businesses. KIC Restoration uses the latest technologies and methods to stay ahead of the competition. Our technicians are IICRC Certified as Goldmorr Master Technicians. This qualification is a must for most home and commercial flood damage restoration projects. Goldmorr Master Technicians are certified to complete invasive, complex modifications at a relatively low cost when compared to other options. Their technique involves the newest Goldmorr technology, which is not available to the average consumer. KIC Restoration enjoys a touted reputation as experts in flood damage in San Diego County. On top of professional qualifications and years of experience, the company emphasizes transparency in all of its projects. This not only means reliable communication with customers, but standardized, no-nonsense pricing. The company also offers a (1) Year Workmanship Warranty on all qualifying flood restoration work. The expense of flood damage repair and the unexpected nature of its causes can seem like an overwhelming problem. Unfortunately, people have to deal with this problem every day. KIC Restoration is the first call when the signs of water damage appear. The company offers a 24/7 customer service line that can help assess the problem and form a plan of attack. Do not trust unreliable contractors with limited experience and outdated flood damage cleanup methods. For a quality job done right the first time, trust the professional service of KIC Restoration.